How to find all the Google My Business categories for a company without logging into your GMB Dashboard. There are times when you can't log into a company's Google My Business (GMB) dashboard to see all of the categories that they have signed up for. I read a great article over at Whitespark by Darren Shaw about a method to find GMB Categories that no longer worked due to Google changing it's display (big surprise). In the article, Darren said that using Google Map Maker is the best way to do this. How then do we know what categories a business or organization has chosen? That's easy, just search for the company in google right? Not so fast. Let's take the case of Summit Bicycles in lovely Burlingame, California. When you search for it in Google you get a helpful Knowledge graph panel on the right. 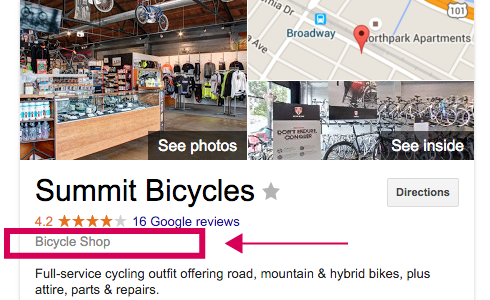 Notice that it only shows "Bicycle Shop" which happens to be an outdated Custom Category. 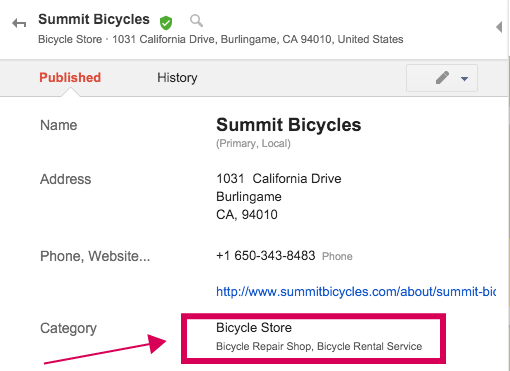 Spoiler alert, there are more active categories in their google my business account.